Biography of Warren William, 1894-1948. From Broadway to pre-Code peak and popular detective series, this 5,000-word piece covers the life and career of our favorite actor. Embeds of some rarer Warren William shorts include a higher-quality upload of Just Around the Corner, plus Warren walking his dog, and in color at his home. 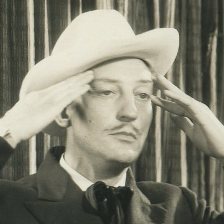 Pointing to episode 48 of the Forgotten Filmcast where I recently appeared to discuss THE MIND READER (1933) with host Todd Liebenow. Plus other site news. Warner Bros. brought over Lil Dagover to be their Garbo in The Woman from Monte Carlo (1932). The movie flopped and Dagover sailed. With Walter Huston, Warren William, and John Wray.